How Did A Texas A&M Recruit's Dad End Up With A Trademarked Hashtag? Texas A&M is known for promoting both football and its brand to the point of absurdity, and so it was more than fitting that they won the competition to land Daylon Mack, a coveted recruit from the Class of 2015. Mack, you see, managed to come out of the recruiting process not only with a scholarship, but with his father holding a claim to a potentially lucrative trademark. A&M would have had every right to contest that claim, and yet somehow didn't. Brand, meet brand entrepreneur. Daylon Mack is a 6'1", 330-pound defensive lineman—"Mack Truck," of course—from Gladewater, Texas. Every major college football program in the country wanted him. His impressive high school highlight reels include clips of him playing running back, blazing past little guys on long touchdown jaunts, and doing lots of reps on the squat rack with more than 600 lbs. Some talent raters had Mack as the no. 2 prospect in his talent-glutted home state, a top-20 recruit in the nation. The Lone Star State gridiron blog Good Bull Hunting called the competition to land Mack, who played his suitors against one another as only the bluest of blue chippers can, the "most contested recruiting battle of 2015." On Feb. 4, Mack announced his college plans to a live crowd and a national television audience. "I'll be taking my talents to Texas A&M University," he said while pulling an Aggies cap from a bag and putting it on his head. Mack then went right to Twitter to break the same news to his nearly 16,000 followers, adding the hashtags #12thMan and #WRTS. First, the old. The school claims supporters of its football team have been describing themselves as the 12th Man since "at least as early as 1922." A&M first registered the phrase with the U.S. Patent and Trademark Office in 1990, and has since registered several similar phrases. The school has also registered other slogans associated with its athletic program, including Maroon Out and Wrecking Crew, as its own. And don't even try using the word "Aggies" in any capacity in Texas without licensing the word from the school or lawyering up. A&M's legal team protects its intellectual property the way a lion would her cubs. #WRTS is the latest addition to the list of A&M slogans. The initialism (it stands for We Run This State) has been used mainly to tweak the University of Texas-Austin, perennial king of Texas college football. It went mildly viral over the last year while A&M was waging its annual recruiting war with all the other football-wacky schools in Texas over Mack and other top prospects. Like 12th Man before it, #WRTS has been registered with the federal government. But not by the school. No, according to the USPTO database, an application for a trademark on #WRTS was filed on June 17, 2014, by Coris Mack of Gladewater, Texas. The filing, called an "intent to use" application, shows Coris Mack plans to attach the phrase to a variety of "athletic apparel," including t-shirts, golf shirts, triathlon shorts, yoga pants and "Toboggan hats, pants and caps." Coris Mack is Daylon Mack's father. The Mack family definitely didn't coin the phrase for A&M. Michael Lagrasta, A&M's assistant director of recruiting, was using it at least as far back as Feb. 2014. So was Jeff Banks, A&M's special teams coach. In August, Daylon Mack talked about his introduction to #WRTS, and didn't claim it was his idea. In his telling, Mark Snyder—then A&M's defensive coordinator, now Michigan State's special teams coach—gets the credit for devising the popular hashtag. Mack said he first became aware of the tag on May 28, when Snyder used it in a tweet celebrating the signing of blue-chip quarterback prospect Kyler Murray. "The whole staff is real smooth with hashtags," Mack said, "so I found out that night what it meant and just started running with it." Use of #WRTS—first over Twitter, and then on t-shirts—became so prevalent so fast that the Dallas Morning News felt the need to run a story explaining to readers what it meant. "You would have to argue the slogan is the brand" to get the government to grant trademark protections, says David Pressman, a patent attorney in San Francisco and author of books on copyrighting. This, it turns, describes Coris Mack's strategy perfectly. "The plan is, the trademark is the beginning of developing a brand around it," says Derek Gilliland. Listed as the attorney of record on the USPTO filing for #WRTS, Gilliland oversees intellectual property litigation for the firm Nix, Patterson & Roach in Daingerfield, Texas. (His bio at the firm says he's an alum of Texas A&M, Class of 1993.) He has been the attorney of record on a total of 11 trademark filings since 2010. Ten were filed on behalf of former A&M superstar Johnny Manziel. ("Johnny Football," "JFF," "JMAN" "Johnny Cleveland" …) The federal database has no record of Coris Mack ever applying for a trademark before or since. According to Gilliland, nobody from Texas A&M brought Mack to his firm. He got Coris Mack as a client because of geography, he says; Gladewater and Daingerfield are about 44 miles apart, a stone's throw in Texas terms. While Mack was conceiving his plans to develop the #WRTS brand, though, Texas A&M was actually already doing so. Dallas Shipp, director of Aggieland Outfitters, says that his stores started ordering their own line of t-shirts with the slogan after hearing from fans about #WRTS. Soon after the shirts first hit the shelves, Shipp says, he was contacted by Texas A&M representatives and told that the school's marketing and legal personnel were in charge of licensing #WRTS shirts on behalf of head coach Kevin Sumlin. "We worked it out with lawyers from the school," says Shipp, adding that he's an alum and a big Aggie fan. "We were told that even though A&M doesn't [own] that particular trademark, it was policing the situation for Coach Sumlin. We wanted to sell the shirts because our customers told us it was exciting and new on Twitter. But we wanted to make sure it was okay with Coach Sumlin." Shipp says he's heard from local chatter that Daylon Mack's family had registered the trademark, but nobody official has ever informed him of that. "All we were told is that Coach Sumlin was enforcing it through the school," he says. All licensing fees on shirts sold at his store, Shipp says, are paid by the manufacturer of the shirts, and those costs are "built into the price paid to the vendor." A clerk at the store says they now get the #WRTS t-shirts from Gildan, a Montreal-based textile giant that also manufactures UnderArmour and New Balance garments. Shipp declined to give exact sales figures, but did say Aggieland Outfitters had sold "several hundred" of the #WRTS shirts, which now go for $19.99. There are many peculiar aspects of this story, but the most peculiar may be that A&M, more than any other school in the land, is known for claiming ownership of slogans associated with its football program and fighting vigorously to keep them. 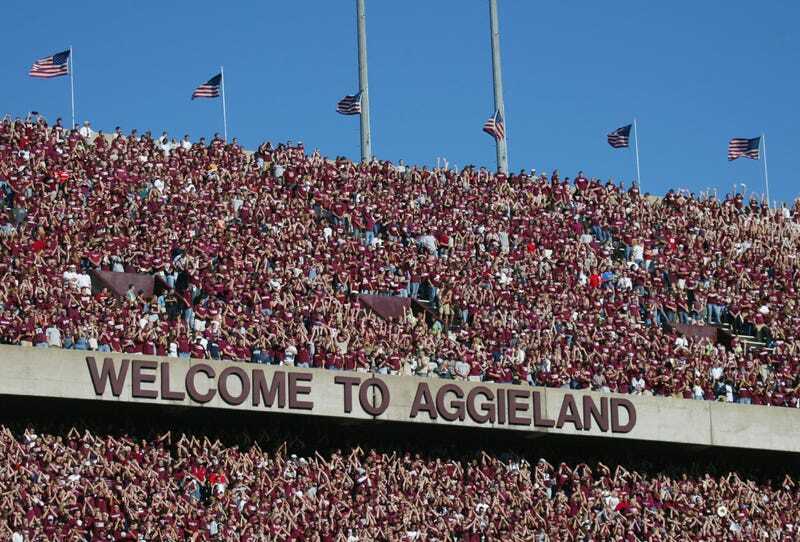 Last year, Shane Hinckley, A&M's director of trademark licensing, estimated that the school had sent out "just south of 200" cease and desist letters to unauthorized users of 12th Man in the previous two years alone. Occasionally, the foes in these trademark squabbles are sturdy; A&M was involved in a longtime battle with the Seattle Seahawks over use of 12th Man, for example. It ended when the school's 2006 lawsuit against the NFL team was settled with a five-year agreement in which the Seahawks got to use "12th Man" in exchange for $100,000 up front and $5,000 per year. (A&M also forced Seattle to agree not to use the phrase in tweets.) They renewed the deal in 2011, and that will expire next year. Hinckley has already hinted that the school will squeeze more money out of the NFL squad, but he told KREM-TV, a station in Spokane, Wash., that it's not about the money. "We are not as focused on financial," he said, "as we are the overall protection of the brand." Plenty of A&M's intellectual property fights, however, have associated the school's brand with petty bullying. In 2000, the Houston Press ran a story about A&M forcing SSQQ Dance Studio in Houston to stop teaching a class in Aggie Jitterbug, which is what rudimentary swing dancing had been called in that part of the country for decades. The studio caved to the legal threats and began teaching something called the Shaggie Jitterbug. The paper mocked the school's tactics by using an Aggie joke: "How many Aggies does it take to dance the Aggie Jitterbug? One to lead, one to follow and one to tell them to cease and desist." "My story is a perfect example of how silly they are," SSQQ founder Rick Archer now says. "It shows they're willing to go to ridiculous lengths to say they own things. I think they were off base, but they're much too big for somebody like me to fight." Last summer, a gaggle of Buffalo Bills fans led by a truck driver named Charles Pellien, who happened to be missing one arm and one leg, got in the school's sights when they started a group to keep the team from moving to Toronto and named it 12th Man Thunder. After threats from A&M's legal team, Pellien and his mates had to change the club's name to Bills Fans Thunder. All of this earned the school plenty of derision. Reuters had a piece headlined, "Texas A&M tackles double amputee over '12th Man' football trademark." Keith Olbermann, meanwhile, took to the air to give an award of sorts to A&M president Mark Hussey and "everybody at that school" for the aggressive tactics. "Screw you!" Olbermann raged. None of the school's characteristic vigor has been in evidence during the #WRTS registration. In fact, they seem to have been exceptionally accommodating. On Dec. 2, Coris Mack's application to register the trademark was published for opposition by USPTO. That gave the public, including Texas A&M and its coaches, 30 days to challenge Coris Mack's right to own #WRTS. The comment period, interestingly enough, commenced during a particularly contentious period in A&M's recruiting of the applicant's son. Mark Snyder, the Aggies assistant coach who had recruited him, had been fired as defensive coordinator on Nov. 28, one day after the Aggies' season-ending loss to LSU. Then, in mid-December, Mack announced via Twitter that he was retracting his verbal commitment and taking on other suitors. "I have decommitted from Texas A&M and I will be releasing my top two schools around noon Saturday!" he said. A day after dumping A&M, he said the choice was between LSU and TCU. Gilliland declines comment on "any discussions I had with the school" about his client's registration of #WRTS, but says there was no quid pro quo at work. "The school has no role in the trademark application," he says. What they do have is Daylon Mack. On Jan. 27, 2015, with no challengers having stepped forward, the USPTO issued a "notice of allowance," giving Coris Mack six months to show the agency that he has put #WRTS to use in the marketplace. If he does, the registration process will be complete. Eight days after the trademark board's notice of allowance, the budding entrepreneur's son announced he was back on board with A&M and signed his letter of intent. Texas A&M has not had any plans—past or future—to trademark, purchase, or otherwise profit financially from #WRTS. Texas A&M was aware of Mr. Coris Mack's trademark application for the phrase, but this trademark application had nothing to do with the recruitment of Mr. Daylon Mack as a student-athlete at Texas A&M. The University also has disallowed licensees from using #WRTS in connection with Texas A&M trademarks, to include official logos, phrases and colors, in the production of licensed goods. As of a couple hours after Hinckley made his statement, Gilliland told me the plan is still to make a brand out of the hashtag. But, this being Texas A&M, #WRTS could still get litigious. Mark Snyder has already moved from College Station to Lansing to begin his new job at Michigan State. He did not respond to a request for an interview made through the MSU athletic department, but his wife, Beth Snyder, says that her husband did indeed coin #WRTS at A&M, while "trying to generate some excitement about the players we were getting in the state of Texas." "It was just spur of moment for him," she says, adding that she will remain with the rest of the family near A&M until moving to Michigan after the school year. "Everybody was excited and pumped up about it, and it just came." Beth Snyder says she only recently found out that somebody with A&M had trademarked the phrase. The informant was a family friend in College Station who was aware of the coach's role in making #WRTS a thing, and was bothered that somebody was trying to profit off her husband's serendipitous creation. "He says, 'We really need to have a discussion about this!' and he's so serious that I laughed," she says. "And he's like, 'No, seriously! We need to talk!'" That family friend is a lawyer, she says.